The tall stance (figure 2.3) is used when the play does not pose an immediate threat. The goaltender stays in a more upright position than in the regular stance. As stated earlier, some head coaches build relationships with their goaltenders, whereas others communicate to their goaltenders through the goalie coach. There are so many variations of offensive attacks that you need to be prepared for. The opposition attack is nonstatic. 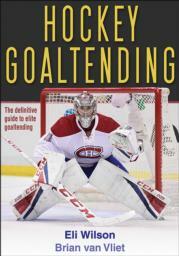 Leading authorities on goaltending bring you the definitive guide to stopping more pucks, winning more games, and lowering your goals against average. Eli Wilson has established himself as one of the premier goaltending coaches in the world. He has worked with dozens of goaltenders in the National Hockey League (NHL), including Carey Price, Ray Emery, Tim Thomas, Tuukka Rask, Brian Elliott, Jason LaBarbera, and Devan Dubnyk. Under his tutelage, Eli's camps have produced more than 50 NHL draft picks, over 60 Division I or Canadian University goaltenders, and more than 200 players drafted by Major Junior teams. His goaltenders have gone on to win numerous prestigious awards and championships: Stanley Cups, Conn Smythe Trophies, Venzina Trophies, World Junior Gold Medals, American Hockey League (AHL) championships, AHL Playoff MVPs, WHL Goaltender of the Year, Ontario Hockey League (OHL) Goaltender of the Year, and Canadian Hockey League (CHL) Goaltender of the Year. In 2004, Eli founded World Pro Goaltending and singlehandedly developed it into one of the largest goaltending schools and training facilities in Canada. When he departed from the company in 2009, World Pro Goaltending was performing more than 5,000 one-on-one training sessions annually, along with numerous camps, including the world-renowned Elite Prospects and Professional (NHL) camps. In 2004, Eli was also named to Hockey Canada's goaltending consultant group, along with Francois Allaire, David Marcoux, and Sean Burke. Since 2004, he has consulted with Creative Artists Agency (CAA) Sports during their summer development camps for top young prospects in Los Angeles, California. In 2007, Eli traveled to South Korea to work with the Kangwon Land Ice Hockey team and other young goaltenders in the country. From 2007 through 2010, Eli was the goaltending coach for the Ottawa Senators, where he was responsible for the Ottawa Senators goaltenders as well as for the goalies playing for their AHL affiliate, the Binghamton Senators. In February 2011, Eli was hired by the Anaheim Ducks to work as the goaltending consultant for their affiliate, the Syracuse Crunch. The Crunch had their strongest run of the season while Eli was on staff, and it pushed Ray Emery's return to the NHL. In 2010, Eli established Eli Wilson Goaltending. Today, Eli Wilson Goaltending is a world leader in goaltending development. Eli runs goaltending camps, clinics, and consults worldwide. In 2016, Eli introduced a number of specialty camps, including the popular 24/7, where goaltenders actually live and train with Eli over a three-day weekend. He has skill-specific camps, including puck-handling camps, and in 2017 teamed up with world-renowned skills coach Darryl Belfry, bringing together top prospect forwards and goaltenders to create a high-intensity training environment. A main staple of Eli's year-round training is advanced video technology, whereby he and his staff can analyze video remotely to further goaltending development. Brian van Vliet has a diverse sporting background. He played competitive soccer for six years and competed in numerous bodybuilding competitions, including the prestigious 1993 Canadian Bodybuilding Championships in Montreal, Quebec. Having studied the position of goaltending for many years, Brian was a member of the board of directors for a local hockey association and served as the goalie coordinator for three years. He was responsible for the evaluation and placement of over 70 goaltenders annually. Brian was an associate writer of Eli Wilson's In the Crease column for the Alberta edition of Hockey Now magazine and later went on to author his own monthly opinion piece for the same publication. His experience as a continuous improvement professional in the oil and gas industry gives him a unique and analytical approach to the game of hockey. Having attained a business management degree from Davenport University, Brian is currently the vice president of business operations for Eli Wilson Goaltending and works as a real estate agent in Calgary.